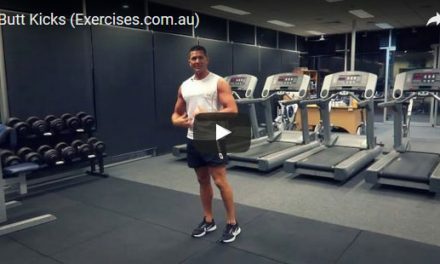 Bent Press is a dynamic compound exercise that targets the core muscles specifically the obliques and serratus areas but also the glutes and hamstrings. It includes a pressing action which works the shoulders. This is an exercise that requires coordination as many muscles are involved and your body will not travel in a set pathway. Your core has to remain tight in order to maintain a strong body position and to protect the lower back. Bring a kettlebell up to your right shoulder level. Assume a shoulder width position but angle your feet 45 degrees toward the left side. Slowly bend at the waist toward your left side. Let your hand travel down your left leg until you find a level where you get a comfortable stretch on your right side and strong contraction on your left side. As you’re bending to the left side, simultaneously press the kettlebell straight up. Hold the position for a count of “one”. Slowly go back to the starting position by pushing your glutes down almost to a quarter squat. Bring the kettlebell down to your shoulder as you are approaching the quarter squat position. 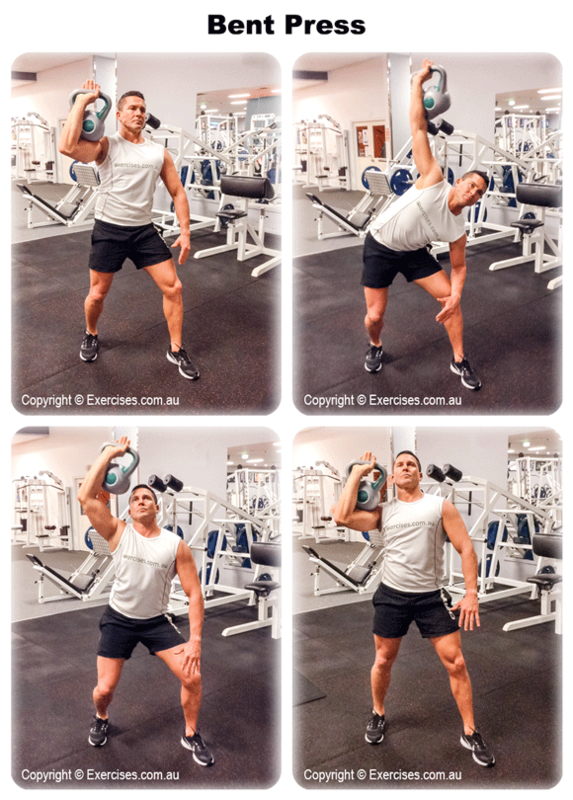 When the kettlebell is on your shoulder, extend your knees and push the hips forward to get back to starting position. Reset at the top position and repeat the exercise. Once you have completed the targeted number of reps, switch arms and work on the other side. Perform the exact number of reps. When performing Bent Press you have to be mindful of form and technique. Keep your body in perfect alignment. As you are bending to one side and pressing with the opposite shoulder, make sure you are not over-rotating or drifting the shoulders too far forward or backward. Keep a slight bend on your knees throughout the exercise.